Bathing, shampooing and incontinence cleansing. Foam product stays in place, no dripping, no running. Easy clean up for more efficient and convenient patient care. No soap residue left on the skin. Collagen aids in maintaining the skin matrix. 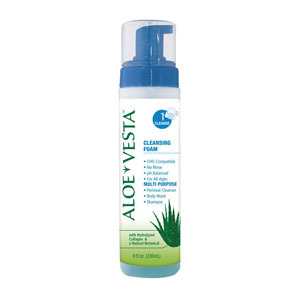 Humectants attract and retain moisture in the skin Aloe is a natural botanical extract that soothes irritated skin. Compatible with pH of the skin.